Stock up on Might & Magic games thanks to Humble Bundle. 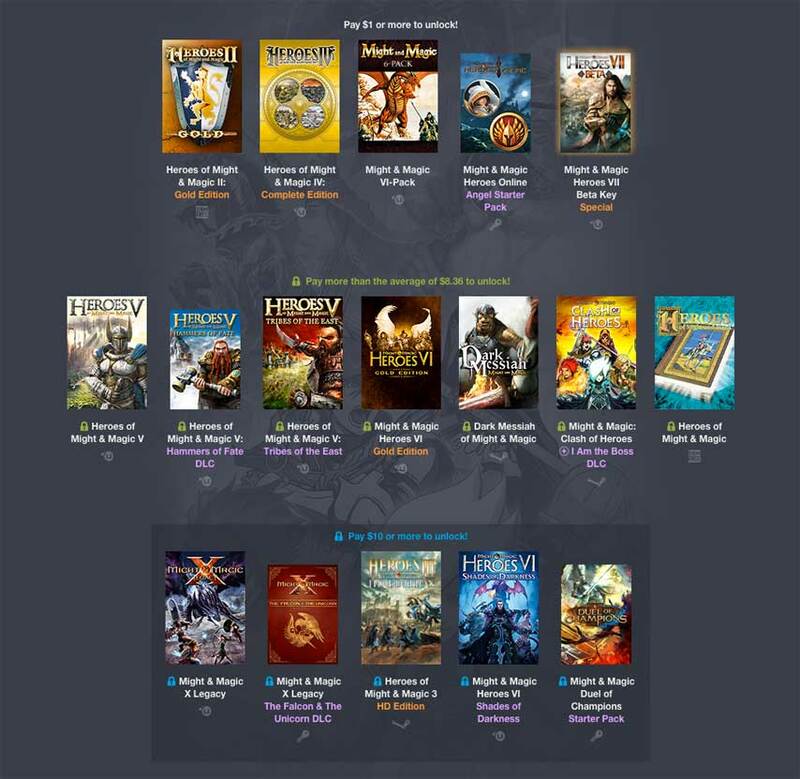 The latest Humble Weekly Bundle is absolutely choccas with Might & Magic goodness. Pay $1 or more and you’ll score Heroes of Might & Magic 2: Gold Edition, Heroes of Might & Magic 4: Complete Edition, a Might & Magic six pack, Might & Magic Heroes Online with the Angel Starter Pack and a Might & Magic Heroes 7 beta key. Cough up more than the average ($8.36 at time of writing) and you’ll also receive Heroes of Might & Magic 5, the Heroes of Might & Magic 5: Hammers of Fate DLC, the Heroes of Might & Magic 5: Tribes of the East expansion, Might & Magic Heroes 6 Gold Edition, Dark Messiah of Might & Magic, Might & Magic: Clash of Heroes with the I Am the Boss DLC and Heroes of Might & Magic. Pay $10 or more and you’ll score Might & Magic 10 Legacy plus The Falcon & The Unicorn DLC pack, Heroes of Might & Magic 3 HD Edition, Might & Magic Heroes 6: Shades of Darkness, and the Might & Magic Duel of Champions Starter Pack. Phew! And this is only scratching the surface of the prolific Might & Magic franchise, which constantly spawns spin-offs. As ever, proceeds are split at your discretion between publisher Ubisoft, bundle organisers and charity; the American Red Cross, charity: water and Doctors Without Borders benefit this time. One caveat I must issue is that the bulk of these products are offered as Uplay keys, although there are some Steam and even DRM-free options Also, Linux and Mac users are fresh out of luck this time. If that’s cool with you, go forth and take advantage.